Freecharge always offers equal value coupons on mobile recharges and bill payments. 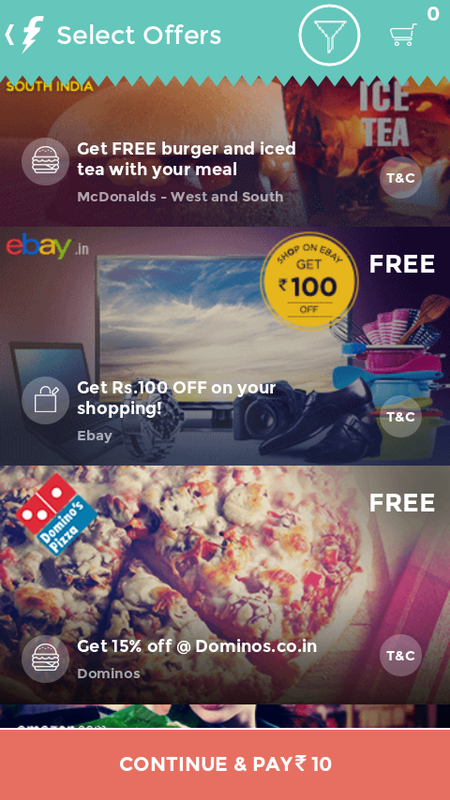 Yesterday it was offering ebay coupons only on desktop versions but now you can avail it on mobile apps also. 1) Just open your freecharge android app and start recharge with minimum of 10 Rs. 2) Select your operator and on the next page, you will find coupons. 3) Probably third coupon is for eBay (100 Off on 110 Rs) which is free of cost, just add it to your cart. Refer to the screen shot given above. 4) Complete your transaction (you can use freecharge credits too) and open your gmail account. 5) Ebay 100 Off on 110 Rs coupon will be mailed to your gmail account. 6) You can redeem that coupon at eBay.in to get flat 100 Off on all products worth 110 Rs. I think it’s not there now.. I have 4 spare coupons and I will give them on 9 pm today. Even if with new accounts coupons are not working. Freecharge term and conditions never said it will work once per user by the way. I am facing same problem. I tried using 2 coupons, both were rejected. Create new ebay account and try applying same. Its not working now, saying exceeded maximum redemption limit. It can be used one time only. Try it on new accounts. I have 5 spare coupons. They will be shared soon.. I think it’s for 9 Rs now… Just recharge with 50 or more.